Purchase this product now and earn 5,906 Reward Points! What’s so good about Modifilan? help remove harmfull cells from you body. Organic Iodine which may support the health of your thyroid gland. Alginate which has the unique ability of binding heavy metals and radioactive elements to its own molecules and secreting them from the body. Fucoidan a polysaccharide found only in seaweed, may help to stimulate the immune system. Promoting APOPTOSIS , Fucoidan can help to naturally eliminate harmful cells from organism. The patented technology of physical extraction and low-temperature vacuum evaporation processing extracts only the inner, water soluble, part of the Laminaria leaf. This enhances minerals, vitamins and polysaccharides for easier digestion and better results. The removal of the heavy outer fiber also increases the remaining extract’s digestibility and bioavailability. After that, extract is encapsulated and bottled. It’s highly concentrated: it takes 40 pounds of raw seaweed to produce 1 pound of Modifilan. In 2001 Modifilan received certification and became a Registered Product ® in the USA. 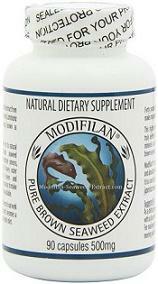 What’s the difference between Modifilan and other seaweed products? A simple test can be done – mix any other types of seaweed products with water and you will see that they do not dissolve entirely but rather make a sludge which never gets digested. When we mix Modifilan with water or juice it develops into a light suspended gel. The extract fully dissolves and this is the best indication of a product’s bio-availability. Recommended average dosage (Indications) is 2 to 3 grams (4 – 6 capsules) daily with glass of water.